Reading the Fantastic Four comics from the start. At the end of the last issue, our heroes were in bad shape. They’d lost their super powers, the evil Dr. Doom had taken over their headquarters and used their weapons against them, and now they’re separated and vulnerable out on the streets of New York. 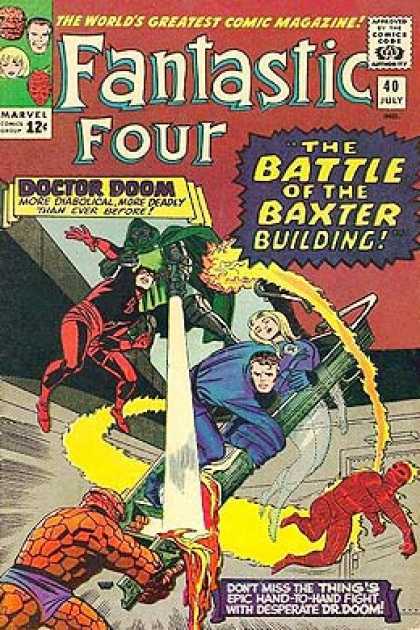 Fortunately, fellow crimefighter Daredevil, who is secretly the FF’s lawyer Matt Murdock, is lending a hand, and was on his way to the Baxter Building to duke it out with Doom. That takes us to issue 40, a landmark of awesome Jack Kirby action. Sue and Johnny pull up in a commandeered taxi (do the FF have that authority?) to pick up Reed. The team’s only hope, Reed says, is to get to his “electronic simulator.” They make it to the Baxter Building, which has been barricaded by cops. A line of dialogue states that the police are under orders from the Pentagon not to attack Dr. Doom, but to let the FF have the first crack at him. (The NYPD takes orders directly from the Pentagon?) Inside the building, Doom attacks our heroes with their own security devices, which are lethal, apparently. Daredevil then sneaks into Doom’s lab for a brief fight. 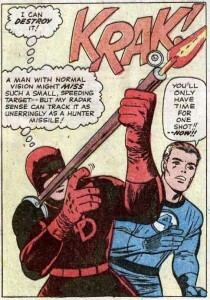 Doom manages to stay a few steps ahead of DD, using more of Reed’s inventions as weapons. Ben shows up out of nowhere and rejoins his teammates. After some business of them being trapped in an elevator, they make it to the lab, where Doom has gotten a hand on Daredevil and wrestled him to the floor. Reed finds the simulator, and we’re reminded that this is the same device he used to boost the FF’s powers to defeat the Skrulls back in issue 37. While Doom beats the crap out of a still-human Ben, Reed restores the super powers to Sue, Johnny, and himself. 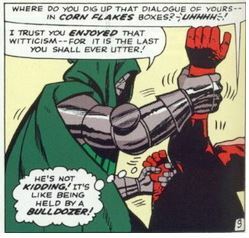 This doesn’t faze Doom, as he uses a “refrigeration unit” to freeze everyone solid, except for the helpless Ben. Reed, with some limited mobility, aims the simulator at Ben. Ben says maybe he wants to stay human, and be normal like everyone else. Reed apologizes, and says turning Ben back into a monster is the only way to stop Doom. In a dramatic three-panel page, Ben transforms back into the Thing. Finally, another cliffhanger: After being transformed into a monster once more, Ben says he’s had enough, and that he’s quitting the team – this time for good. To be continued! Unstable molecule: Again, one has to wonder what goes on in Reed’s lab, where are there are all these deadly weapons just lying around. Fade out: The spotlight is on Ben this issue, so poor Sue spends the whole thing on the sidelines. 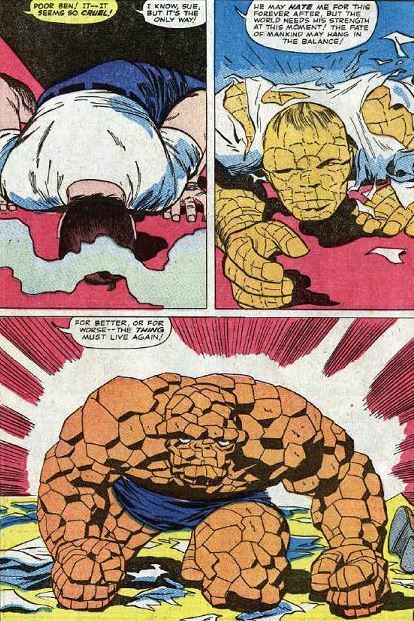 Clobberin’ time: For as much as the Fantastic Four’s saga is all about the rivalry between Reed and Dr. Doom, this one establishes a secondary rivalry between Doom and the Thing. In future issues, look for occasional references to Doom’s disdain for Ben. Flame on: Like Sue, Johnny pretty much sits this issue out, although I love that he shouts “Va-voom!” after getting his powers back. Trivia time: One of Doom’s weapons he uses against Ben is a gun that takes molecule-sized pebbles (!) and transforms them into giant boulders, firing them at Ben. Doom can be seen using this “boulder gun” in one of the Capcom/Marvel video games. Fantastic or frightful: Basically, it’s an “all they do is fight” issue, but it’s Jack Kirby just bringing it with the art. Nobody does big action like Kirby, and this issue just proves it.